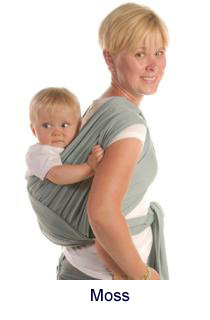 The Moby Wrap is a 100% cotton baby carrier that is amazingly comfortable and easy to wear. The design of the Moby Wrap means it uses your entire back and shoulders making it ideal for parents with bad backs or mobility issues. The Moby wrap is a wide, one size (5.5m long) piece of fabric with no buckles, snaps or other fasteners. The Moby wrap is provided with an easy to follow instructional guide on how to use and tie the wrap Your baby is wrapped close and tight, ensuring a secure hold. 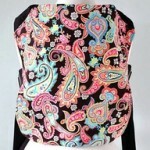 Your baby’s head can also be secured under the stretchy cotton fabric for added safety. You can finally have both hands free and know your baby is safe and secure. 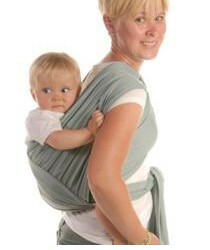 The Moby Wrap is a good baby carrier for premature infants. Prematures are often prescribed to practice “kangaroo care” and this skin-to-skin practice used to increase birth weight can be easily achieved while wearing the Moby Wrap. The Moby Wrap is long enough to adapt to your growing baby. 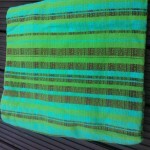 The fabric can hold up to 45 lbs, and most people feel comfortable carrying up to 35 lbs. When not being used as a carrier, the Moby can be used as a blanket, pillow or anything else that comes to mind.